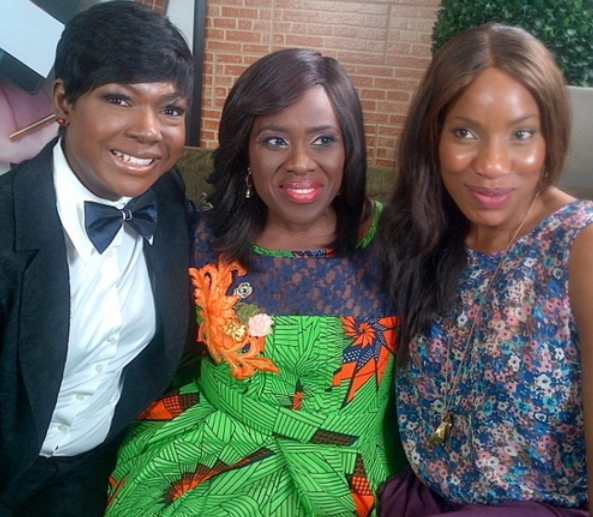 In a recent episode of The Adora Oleh show, veteran Nigerian actress Joke Silva, the wife of actor Olu Jacobs and actress Susan Peters were the guest. Adora Oleh, the host of show took some time out to snap special moments with the movie star. Sources claim Susan Peters stole the show from madam Joke Silva with her hyperactive personality while the veteran actress laid low. Here is another photo of Susan Peters on the show. That Susan her own too much. She was the same lady who caused a scene when she was invited to Aso rock presidential villa in Abuja together with other movie stars few months back. I saw that Adora was starting a show in a newspaper, but I’ve not seen any episode of the show. Hopefully, I’d see it as time goes on. . . I guess that’s Susan’s behaviour. I wouldn’t fault her for that, though.